USA or Malaysia: which country is more expensive? 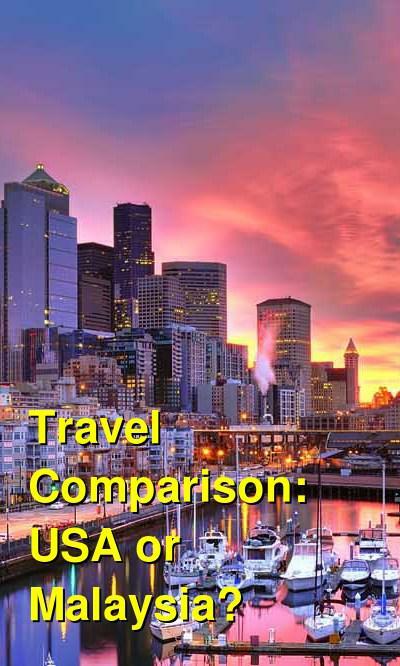 This comparison of travel costs between Malaysia and the USA examines average prices across multiple categories. Please visit each country's individual budget page for more detailed information. Should you visit the USA or Malaysia? Malaysia is a much more affordable travel option than the United States. Malaysia offers great beaches and jungle adventures in the setting of a modern, developed nation with plenty of luxury for those that want it, but at much lower prices. On the contrary, travel in the U.S. can be quite expensive. The U.S. is large and diverse, but this size and diversity helps to increase its overall cost for tourists, whether they be American or foreign. Transportation in the U.S. is quite high, and budget accommodation within and near large cities and major tourist attractions is usually much higher than it is in the rest of the world. Malaysia offers a great deal to visitors from gorgeous beaches, crystal clear waters for snorkeling and scuba diving, exotic jungles, cooler highlands with agricultural landscapes, and delicious cuisine. In general, Malaysia's economy is less driven by tourism than many other countries. 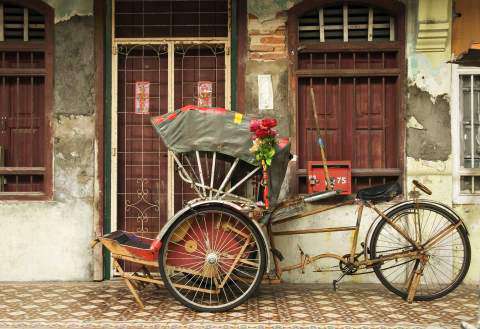 This makes it easier to have a more "authentic" experience in Malaysia, as one can mingle with the locals to see how they live and work, as well as vacation along side them instead of having them provide a service for you in the tourism industry. When is the best time to visit the USA and Malaysia? Malaysia stays hot and humid throughout the year. Due to shifting seasonal winds, the wet season on the eastern coasts is between November and February, while the wettest months on the western coasts are April and October. These wet seasons are usually not to be of any concern, as the rains are not so bad that they would ruin a vacation. However, scuba diving enthusiasts should take note because the water visibility is dramatically affected during the rainy seasons. Why is the USA more expensive than Malaysia? In general, the US is an expensive place to visit. The high cost of living and the vast size mean that transportation costs can be quite expensive. If you really want to see a lot of the country, flying is really your best option. Amtrak is the most well known train system, but it is limited to where it goes and prices are quite high. In some situations, flying is cheaper than taking the train. If you want to explore the country's impressive national park network, a rental car is a must. Malaysia's economy is much less dependent on tourism than some of its neighboring countries. Therefore, visitors usually depend on the same general infrastructure and transportation system as the locals. Public transportation is modern, efficient, and cheap. Accommodation also tends to be better in quality for a lower price in Malaysia due to the overall pro-business economy, and a diverse range of restaurants keeps prices for food competitive throughout the country. What are the most expensive and cheapest cities and regions in the USA and Malaysia? Prices in Malaysia are relatively cheap throughout. As the capital city, prices in Kuala Lumpur can be a bit more expensive than in rural areas, but budget options are still plentiful. If you visit the most popular areas for tourists, such as some of the islands or the Cameron Highlands, you might pay a bit more for a rental car or a tour. Also, public transportation in some touristy areas can be a bit limited, leaving you to take a taxi or rent a car. Compared to peninsula Malaysia, Borneo can be quite expensive. Although budget accommodation and cheap food are available, most people in Borneo choose to do a variety of activities. This is where the price starts to climb (but is well worth it). Depending on what you choose to do, Borneo can quickly become one of the more expensive places to visit in the area. How you can save money when visiting the USA and Malaysia? Many larger cities in the US have cheap public transportation systems that can save you money. Consider this when you plan your trip, especially if you intend to rent a car for a portion of your trip. Many urban areas in Malaysia have terrific public transportation (such as in Kuala Lumpur). Use it whenever possible, as taxis can get expensive. Slow down. If you're rushing through the area you're going to spend more money. Transportation costs can be expensive so the more places you visit, the more money you're going to spend.